WAUKESHA, Wisc.--(BUSINESS WIRE)--At an event held today at Hospital for Special Surgery, GE Healthcare (NYSE: GE) introduced MAVRIC SL, a novel magnetic resonance (MR) imaging technique designed to address the growing clinical need to more accurately image soft tissue and bone in patients with MR Conditional-labeled implants, such as joint replacements and other instrumentation. According to a Hospital for Special Surgery study published today in The Journal of Bone & Joint Surgery, MR imaging can detect inflammation of the joint lining (synovitis) in patients with metal-on-metal hip implants long before symptoms appear, allowing for a more conclusive diagnosis and effective planning for follow-up care. Patients with complications from joint replacement surgeries may present with pain and/or altered gait mechanics, or may have no symptoms at all. 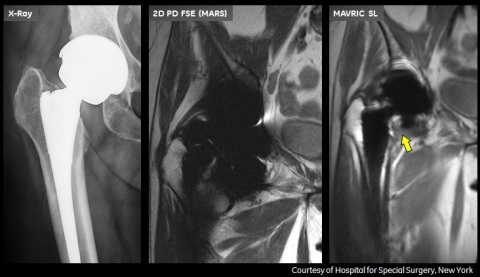 Prior to the availability of MAVRIC SL, achieving quality diagnostic MR images of the anatomy near implants was often not possible due to image distortion caused by metal used in implanted devices. MAVRIC SL reduces image distortion in the regions near MR Conditional metal implants, enabling physicians to see tissue surrounding an implant to help them with diagnosis and defining a course of treatment. In some cases, MAVRIC SL can reduce the need for biopsy or exploratory surgery. MAVRIC SL was developed as an innovative solution to a major clinical problem, uncovered as a result of a collaborative effort between GE, Hospital for Special Surgery and Stanford University. It is one of the latest offerings in GE’s MR portfolio designed to increase access to MR imaging for patients with metallic implants, all while maximizing patient care and reducing costs on the patient and healthcare system as a whole. 3. Kurtz S, Mowat F, Ong K, et al. Projections of primary and revision hip and knee arthroplasty in the United States from 2005 to 2030. J Bone Joint Surg Am 2007;89:780–785. 4. Nawabi D, Potter HG, et al. Magnetic Resonance Imaging Finding in Symptomatic versus Asymptomatic Subjects Following Metal-on-Metal Hip Resurfacing Arthroplasty. Journal of Bone & Joint Surgery. Vol 95, Issue 9. MAVRIC SL is a combination of an acquisition technique and post-processing software intended for use on GE 1.5T and 3.0T MR systems. MAVRIC SL is suitable for use on all patients with passive MR Conditional orthopedic implants that are scanned according to the conditions of safe use for the specific MR Conditional implant being scanned. In addition, MAVRIC SL is suitable for use on patients without implants that are cleared for MR exams. MAVRIC SL helps reduce artifacts caused by presence of metal in both in-plane and through-plane dimensions compared to conventional MR imaging techniques. Thus MAVRIC SL allows visualizing more tissue in the vicinity of MR Conditional implanted metal instrumentation. When interpreted by a trained physician, images generated by MAVRIC SL provide information that can be useful in determining a diagnosis. MAVRIC SL is non-invasive, radiation-free and needle-free as it requires no contrast media injection. MAVRIC SL received Food and Drug Administration (FDA) 501(k) clearance in December 2012 and is available in most markets. GE Healthcare introduced MAVRIC SL, a novel MR imaging technique to address growing clinical need to more accurately image soft tissue and bone in patients with MR Conditional-labeled implants.